House at the top of the hill, mountain view, 2 Bedrooms, 2 Bathrooms, garden. On the ground floor there is a small entrance hall leading to a very spacious open plan kitchen/ living room /dining room with comfortable sofas and a cosy split level area close to the working fireplace. The kitchen is very well equiped for the amateur or gourmet chef. There is also one bathroom with a shower. On the first floor reached by a beautiful wooden staircase there are two further oak floored double bedrooms and a bathroom with a bath. Balcony with a splendid view of the surrounding hills and the Alps dominated by Monviso. The bathrooms are supplied with soap, shampoo and hairdryer. In the grounds of Cascina Bricchetto you will find a covered area for eating outside, a covered parking area and various toys for the children. Internet access within and outside the houses. I have two dogs who share my days , and the female is called Peppa is a Pyrenean Shepherd 6 years old , the male is called Pippo and is a small mestizo 3 years. In my life I have experienced so many things and met so many people , I have worked in both private and public companies and the last period of this phase I lived as a freelancer in many regions of Italy, while on vacation days ran to work and learn from technical experts and farmers the techniques of cultivation of the vineyards that surround the farm and I planted many trees , I finally decided to devote myself exclusively to the agricultural activities of Cascina Bricchetto Langhe and to proceed in the renovation of the ancient stone structure and obtain guest houses. I bought “Cascina Bricchetto Langhe” the year 1995, and some years ago I left my consultancy business and settled here to manage the farm operations. When I open the shutters in the morning, I often think: “how beautiful Monviso is in the sunshine, or how wonderful the clouds are in the sky , or how magical is the misty landscape, or, even how fairy-like the snowfall is!” Then when I close them in the evening, I see the lights of the small villages in the hills opposite (Diano d’Alba, La Morra) and of the houses scattered among the hills and I thank heartily my lucky stars what led me here, where you are surrounded by such beauty. It was during one of those moments that I thought I would like to share this marvel with other people as well and so I started renovating to create two completely autonomous accommodations to be used for farm holidays. Our homes offer the opportunity to personally experience the 'charm of the old Piedmont' inserted in a modern comfortable environment. Living in an old stone farmhouse means of keeping cool in the summer and warmth in winter, the beauty and warmth of a wood fire that heats the radiators perhaps supplemented by a few hours of gas heating. Experience the silence broken only by bird, rediscover the joy of the voices of children playing. Enjoy the beauty of the ancient (vaulted brick ceilings, antique furniture in precious woods) joined to the efficiency of household appliances, enjoy the pleasure of a hot bath or shower at the right point and fragrant, live in the landscape that comes from the numerous and large windows to enjoy colorful sunsets on the balconies or terraces covered by drinking a glass of our beautiful wines. The cascina has a 360 degree view of the Le Langhe hills and on a clear day Monviso and the Italian Alps can be seen. WiFi internet available inside and outside the farmhouse. Italian coffee pots of various sizes, coffee maker and electric filter coffee filters. Fullly equiped for gourmet cooks. Along worktop, dishwasher, extractor hood, gas stoves, steel cookware, mixer, toaster, electric mixer, various accessories. Detergent provided. Dining area, the antique table is made of cherry wood and you can open a book, is closed for 6 people open for 10. Tablecloths provided. We spent a lovely week at Cascina Bricchetto. The house was very comfortable and the views stunning. Our two boys (age 4 and 2) enjoyed the gardens and play area, in particular the sandpit. Giovanna was really helpful recommending local restaurants and we spent a few days exploring local towns and villages. Highly recommended. Children are welcome tu us, there are games for all ages including a small pool. Many thanks for the recognition of our work. We loved our stay and still can’t get over the views and landscape surrounding the house. Giovanna made her home feel like ours. We hope to return soon! Amazing appreciation of the beauty of the places, the enthusiasm for food and wine, the communicated pleasure of the discoveries. Your return will be exciting! Away from it all, Casina Bricchetto offers spectacular views over vineyards and, in the distance, the Alps. Giovanna, the owner, provides a warm welcome with some nice welcoming touches. The hazelnut cake was delicious. She is willing, if asked, to provide local information and help with bookings. The house is very well equipped, comfortable and cool with access to outside dining space. 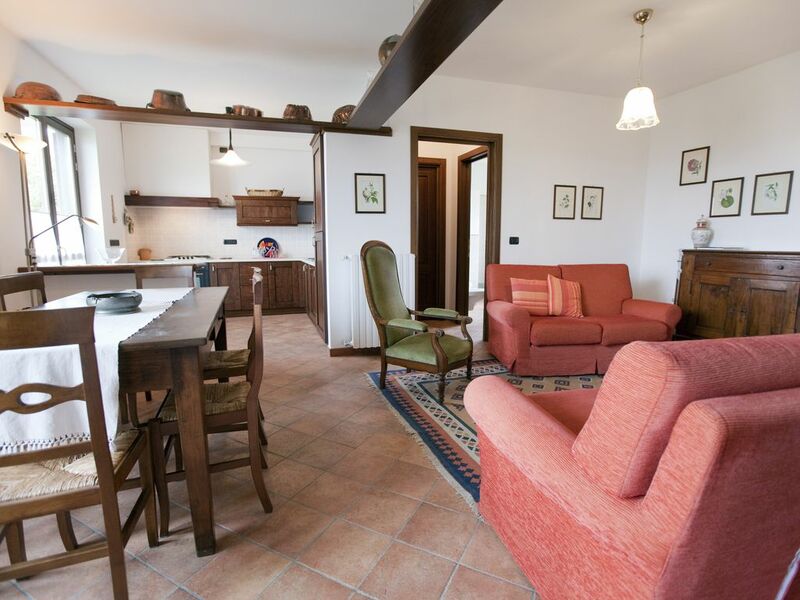 Ideally situated for exploring the Langhe area and all that it has to offer which is considerable. The localisation is very good, the house is clean and beautiful and the view amazing. The hoste is ok and her rigidity was not pleasant during our stay. My colleagues and I spent three nights at Casino Bricchetto while visiting Piedmont for wine tasting. The house is beautiful - restored retaining some of the original architecture while being very comfortable and up to date. The rooms are spacious and the kitchen and bathrooms have are all new. While atop a hill with great views, our visits to Barolo and Barbaresco and environs were all within 30-45 minutes drive. Our host Giovanna took great care to make us lunch and dinner reservations and also assisted with booking tastings. She also prepared wonderful breakfast with local meats and cheeses, breads, and home made cake. I'd definitely recommend Cascina Bricchetto and hope to stay there again with family in the future. Many visitors/guests arrive in our territory to visit the cellars in which the famous Barolo and Barbaresco wines are produced for tasting them in the place of origin. During their stay discover the beauty of the territory and our hospitality, the charm of "old Piedmont" conjugated with the modernity. I hope that as a result of the experience they will become "ambassadors" of our territory and the products of excellence (not just wine) that stand for it. Thank you so much for the review, I will welcome you in the future with pleasure if you come back. Fantastic view from hill top ! We had a wanderful time at this property location was top of the hill and we had 360 degree panoramic view for grape field. Time was just for harvest farmers are working on taking grapes out of tree. Owner has lovely two dogs very friendly and cute. We asked owner to make arragement for local restourant that was great her recommendation was just light and we enjoy very much. We strongly recommend that if you have a plan to visit Alba stay at this place. Most of local atructions are within 15 to 30 minuets drive.